Banten in the fifth century was part of the Tarumanagara kingdom. A stone inscription, called Prasasti Cidanghiang, coming from Tarumanagara era can be found at Lebak area at the bank of Cidanghiang river, in Pandeglang Regency, Banten. The Prasasti Cidanghiang, found in 1947, contains 2 lines of poetic sentences in Sanskrit written in Pallava characters. The inscription proclaims Purnawarman as the standard for rulers around the world. After Tarumanagara power declined, probably due to a series of invasions from Srivijaya kingdom, all Tarumanagara territory, including Banten, was controlled by Sunda kingdom. Banten was part of Sunda kingdom; based on travel records of Prince Bujangga Manik, a Hindu Sundanese monk who visited all of the holy Hindu sites in Java Island and Bali Island at the beginning of the sixteenth century AD. These manuscripts are saved in the Bodleian Library of Oxford University of England since the 16th century. In this era of Sunda kingdom, Banten became one of the important ports of the kingdom. Portuguese historical record indicate that Sunda kingdom included the city of Dayo Pakuan Pajajaran (currently Bogor city), the town and lands and port of Banten, the port of Pontang, the port of Cigede, the port of Tangaram (Tangerang), the port of Sunda Kalapa, and the port of Cimanuk. In 1524/1525, Sunan Gunung Jati from Cirebon Sultanate (former vassal Sunda kingdom) together with Demak Sultanate armies seized port of Banten from the control of Sunda kingdom, and established Banten Sultanate affiliating to Demak Sultanate. Islam preachers have penetrated and introduced people the peaceful way of life of Islam and as result many people in the region embraced Islam as their belief. During 1552-1570, Maulana Hasanudin ruled as the first Sultan of Banten. Banten then become a part of West Java province in 1925 when Dutch Colonial established West Java province, the first province in Indonesia, referring to a statement from Staatblad number 378. 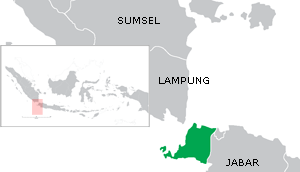 In the present day, the area of Sultanate of Banten is a province. The province was established on 17 October 2000 through the Law Number 23/2000, but the peak of celebration to the establishment happened on 4 October 2000 when tens of thousands of citizen of Banten came to the People’s Representative Council (DPR) building at South Jakarta, at the same time as the plenary meeting of the parliament to authenticate the law of forming the Province of Banten. Therefore the society of Banten mutually agree to set 4 October 2000 as day of the establishment of Banten Province. As of the 2005, the population of Banten is estimated to be 9,308,944. As of the 1990 census, the population was 5,967,907 (increased approximately 55.986% in 15 years). The two biggest regencies in terms of population are Tangerang, and Serang. Tangerang Regency is inhabited mostly by Sundanese meanwhile Serang Regency is inhabited mostly by Javanese. Together, these regencies make up approximately 55.76% of the Banten population. Major urban population centers are Serang, Cilegon, Tangerang and South Tangerang cities. Banten consists of Bantenese, Sundanese and Javanese. Sundanese toponyms are common in these regions which often begins with the morpheme ci-, which means “river” or “water”. In urban centers, other minorities such as Chinese Indonesians and Arabs are common. The most dominant language is Sundanese. The indigenous people living in Banten Province speak a Sundanese dialect derived from archaic Sundanese language. The dialect is classified as informal or harsh layer in modern Sundanese language, having different layers as Javanese language. However, in the towns of Serang and Cilegon, the Banten dialect of the Javanese language is also used by Javanese ethnic group. And, in Northern part of Tangerang, Indonesian language with Betawi dialect is also used by Betawi immigrants. Besides Sundanese, Javanese and Betawi dialect, Indonesian language is also widely spoken especially by other ethnic immigrants from other parts of Indonesia especially in urban centers. Golok is the traditional weapon in Banten and Kujang is used by Kanekes (Baduy) people of Banten. Banten is a province of Indonesia, located at the western end of Java Island. Banten has an area of 9,160.7 km² and population of 9,083,114 (2005). 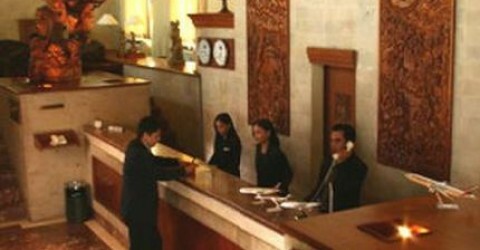 Banten was established in October 2000 after being separated from West Java province. The capital of the province is Serang. Old Banten (Indonesian: Banten Lama) is a historic city which was the capital of the Indonesian Sultanate of Banten. It is now part of the Serang Regency located about 11 km north of Serang city. Today, Old Banten is a historical tourist attraction, where many people visit to pay their respects and prayers (ziarah) at the graves of Sultan Maulana Hasanuddin and his descendants. The area reflects the sultanate’s earlier glory, which can be seen in the Great Mosque of Banten, the watch tower, the remains of the Kaibon Palace, the water systems and the artifacts at the Museum of Banten Artifacts.